Join the J for our first ever Wellth Week! Wellth Week is designed to educate J members and the community about the importance of living a wellthy life. J Wellth (Wellth = Wellness + Health) is the signature program of the Lieberman Family Wellness Center (LFWC) at the J that empowers people to live life better by providing exceptional experiences in health, fitness and wellness. Presented with participation from Baylor Scott & White Health. The entire week is comprised of events and activities designed as an immersive experience so that participants can better understand all the resources available to them to live a wellthy life. Participants will be exposed to cutting edge health treatments, experts in their field, balanced nutrition and evidence-based stress-reduction techniques. Some are informative and some and fun! We have a variety of activities for people in all stages of life and levels of physical activity. 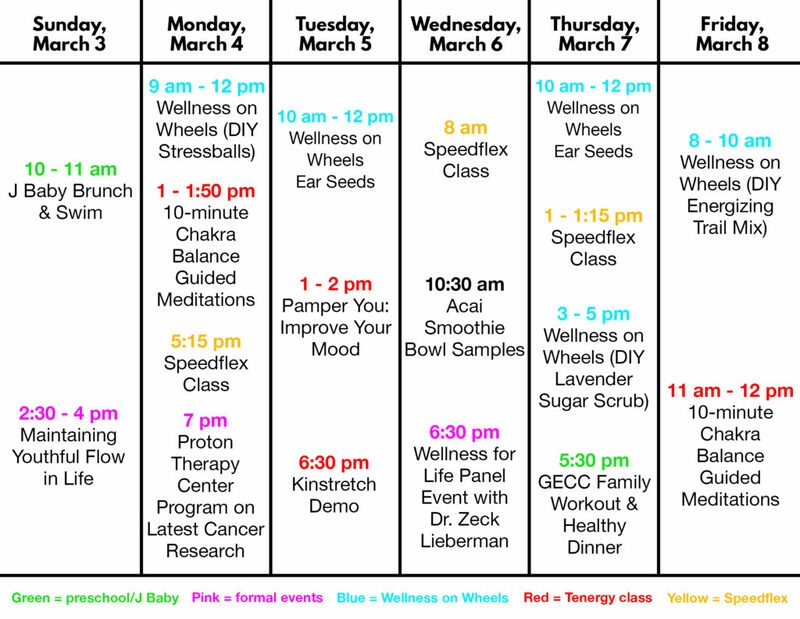 Wellness is a lifetime commitment – check out the events and activities below and sign up to get wellthy with us! The entire week is free to the community, so it is our vision that many will take advantage of this unique opportunity and implement their learnings into their daily life. Wellth Week will also connect members and the community with local health and wellness resources. Click on a green tab to view descriptions for each of the events throughout the week! Click on an event below to expand for more information. Kick-off Wellth Week with four-time Olympic Gold Medalist, Lenny Krayzelburg, for a J Baby Brunch and Swim for both parents and baby! Lenny is the CEO and founder of the Lenny Krayzelburg Swim Academy, celebrating its 5-year anniversary here in Dallas. Join us in the warm-water pool for a class that will teach you skills, tips, and techniques to give your baby a head-start on wellness for life. Stay after for brunch with fellow families and Lenny! Ages 3 months and up. Join two of the J’s most popular exercise and health instructors as they share their philosophies of youthful living, purposeful stretching, and exercising for a beneficial lifestyle. Debbi K. Levy and John Ranello will provide the mats and all the tools for their 90-minute educational talk and workout. Be prepared for physical activity that will lift your spirit and your attitude about aging. Open to all levels of fitness. Vitality Bowls Super Food Cafe in Preston Hollow Village will be present with samples of delicious, nutritious, and super food-packed açai smoothie bowls. Healthier snacks are easier and tastier than you think! Head on out to J on Wheels that will be parked outside the J for activities designed to help you relax, reset, and rejuvenate. DIY Stressballs with Brett Unell, Baylor Scott and White Health Wellness Coordinator – Everyone needs a break from the stressors of everyday life. Come learn mindfulness techniques and make your own stress ball to help bring you into the present moment when times are tense. Get ready to release anxiety and destress in only 10 minutes. This guided meditation will allow you to leave refreshed and complete with positive energy. Join us on the meditation cushion for one or all three 10-minute sessions. This class is for everyone; people new to meditation and seasoned practitioners. Led by Tanya Hardison. Come try out the workout class that’s all the rage at the J. It’s a 27-minute, total-body, high-intensity, low-impact workout that’s suitable for any age or fitness level. Please click here to RSVP for your spot (or download the Spivi app); registration not open until one week before class. In the ever-evolving fight against cancer, proton therapy leads the way by delivering targeted radiation to tumors. Learn more about this cutting-edge technology and what cancer diagnoses are appropriate for this kind of treatment from a leading expert. Prior to joining the Texas Center for Proton Therapy, Dr. Lee was at MD Anderson Cancer Center, where he pioneered many firsts in the field of proton therapy. In order to stimulate acupuncture points without using needles, acupuncturists often rely on ear seeds, also called ear beads or pellets. The seeds are typically from the Vaccaria plant and are secured onto the ear with adhesive tape. They stimulate the acupuncture point by exerting mild pressure when pressed or rubbed. Because there is no needle involved, it’s completely pain-free and a great alternative for kids or those with needle-sensitivity. Ear seeds are good for anyone experiencing stress, anxiety, headaches, and pain. Back by popular demand! The J has a weather-lifting cure for winter blues. If sun makes you happy, our custom-designed Vitamin D class is just what you need to boost your mood. Energize your mindset with sunlight Vitamin D treatment, relax with a hand massage, and release with a deep stretch meditation. Led by Barbara Edes & Kama Blankenship. Stretch your limit with this mobility class designed to develop and improve flexibility, maximal body control, and usable ranges of motion. This session is designed to help participants improve performance and reduce the risk of injury with sports and activities they enjoy. Led by Nick Dobson, Baylor Scott & White Institute for Rehabilitation. Stop by the main lobby to sample delicious, nutritious, and super food-packed açai smoothie bowls from neighboring Vitality Bowls Super Food Cafe in Preston Hollow Village. Healthier snacks are easier and tastier than you think! In this keynote panel discussion about the importance of staying active from 0 – 100, our very own Dr. Lieberman, the inspiration of the Lieberman Family Wellness Center, will provide his insight about wellness: where it’s been, where it’s going and his personal practice. He will be joined by special guest, Shahaf Bareni, who holds the high jump record at UNT and is vying for the 2020 Olympics, as well as Debbi K. Levy, the J’s renowned fitness and mindfulness instructor, and Sports Performance Coach, Henry Aleck from Baylor Scott and White Health. Lavender has been shown to be a great relaxation aid and has benefits linked to calming your stomach, mind and skin. Relax with Cleerlife owners, who will help walk you through the easy process of making your own lavender sugar scrub to use to unwind at home. It’s never too early to start living a healthy lifestyle. Our GECC families are invited to join us for an evening of wellness. Families will participate a fun workout together and then sit down for a healthy dinner catered by our very own J Chef, Eli Cohn-Wein. All activities are designed to be easy and replicable at home. Wellth Week will culminate with a day to step back from the distractions that technology can bring to our life. As members and the community enter the building they will be given a phone “sleeping bag” to encourage a break from technology and more connection with those around them. Additionally, J Staff will be encouraged to unplug from email for the day and instead take a walk to their colleague to discuss daily matters. Healthy snacks are an important part of a balanced lifestyle. Hop in the trailer to make your own energizing trail mix that will help give you a boost during the day without the crash that can follow from mindless snacking. With Baylor Scott and White Health Wellness Coordinator, Brett Unell.